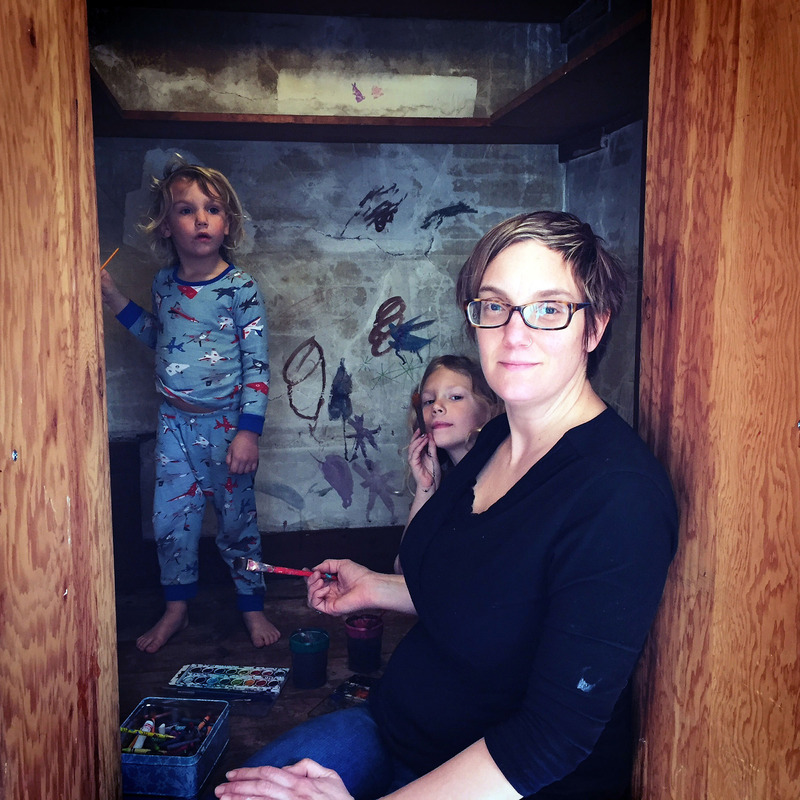 In 2016, Ruby May, Heilo Blue and Kari decorating the “magic room” of their new home, originally built as cold/dry storage for food in the early 1900s. It's a kids-only club house where big play and imagination happens. This is a conversation between Kari Radasch, Elizabeth “Beth” Robinson, and me, Leanne McClurg Cambric, who documented it. We all are working artists and moms of young kids, who graduated from high-profile masters programs in the early 2000s and have had a running fifteen-year dialogue about our struggles to balance our personal and professional lives. Even finding time for a conversation like this one was a challenge, as we live in three different time zones. Kari: Most of the time I’d pay ten dollars for ten minutes [of kid-watching]! Beth: I was finally able to find someone really great for ten dollars per hour. It's awesome. I’m hoping it will help take enough stupid stuff off my plate so that I can actually make pots again with regularity. Leanne: Are we trying to be twenty-four-hour women? Artist, mom, wife, educator, intellectual, and still stunningly good-looking in our forties? Beth: Lisa Orr was one of the first people I called when I got pregnant and was trying to puzzle out what this whole life-as-an-artist-with-a-child thing might look like for me. She was one of the only people I knew personally in the field who had both a career and a young family. Her advice helped me realize, among other things, it wouldn’t be a good idea to schedule a workshop a month after the baby was supposed to be born. Seeing her in action during Art of the Pot the year before I was pregnant helped put motherhood in the context of an active maker. Later, when I was completely in over my head with a colicky three-month-old, Sandy Simon called to invite me to be part of a two-person show in her gallery. I was so overwhelmed by my high-needs baby and some issues with my physical recovery from childbirth that I had given no thought to making anything. I told her, after making her listen to my whole sob story, that I couldn’t believe I was saying it, but I would have to pass—something I never would have done before becoming a parent. As a mother herself, of grown children, she understood where I was at, and was encouraging and supportive. “You can do this,” she said, “Let’s just schedule the show a few months later.” This was a defining moment for me. Adrift in the sea of new motherhood, it was the moment when I started to see a bridge between my former and present life. I’ve always been so grateful to her for working with me then. It gave me courage to start making again and to learn how to be realistic about what I needed when dealing with other professional opportunities. I’ve found gallery owners and customers—male and female—to be understanding and supportive when I bring up my limitations, such as deadlines and availability of work, because of having small children. The thing I have struggled with most, however, is the ability to gauge accurately what those limitations might be. Both motherhood and health issues that have become more burdensome over the last decade put me in a position where my time is not my own, where too often time I have set aside for work gets co-opted by other needs. It’s been a struggle to find a truly realistic approach to making commitments. I have tended to over-commit or overestimate what I can do, then failed to deliver, and that is obviously damaging to relationships with galleries and customers. I’ve been guilty of this more than I’d like to admit. The solution I finally arrived at, albeit somewhat haphazardly, was to take a hiatus from making while I focused on taking care of other life and business issues and other creative projects. Have either of you totally “flaked out” when it came to deadlines? How have you handled this? Leanne: I’ve probably “flaked out” on something and not even remembered because I had taken on too much. I can think of other moments that are the opposite of your experience with Sandy Simon; for example, when someone decided for me that because I had kids I was somehow not able to commit to something professionally, which I find a complete joke. I get a lot done in a day, and I would rather be the one to decide what I can and cannot do. I resent someone presuming I can’t be professional or productive because I have kids. Most of the time I find that bias comes from people who have not had to balance raising children with being a professional. While fathers generally play a bigger role in raising kids than they did in previous generations, I rarely see someone show the same bias towards father-artists; they are treated as being capable professionals because of a long-held presumption that the mom is the main caregiver. I think there is a good lesson in that Sandy story: help out by asking and encouraging, not presuming. I would love to see more grants and residencies include childcare to help enable artist-parents, or to even consider the school calendar when placing a timeline for residencies. The biggest reason I might “flake out” is because of the lack of affordable, available child care, not because I am incapable of deadlines and professionalism or uninterested in diving into the studio to make work. Kari: In the last seven years I have over-committed, flaked out, and completely forgotten things. The worst was a few years ago when I had to bow out of participating in a well-known invitational show. I still have a pit in my stomach about it. I say “no” more comfortably now than ever before. I despise working manically, stressing out my family, and orchestrating a revolving babysitter door. I try my best to be realistic with the commitments I make, but the optimist in me gets carried away occasionally, and I have to circle back around for cleanup. 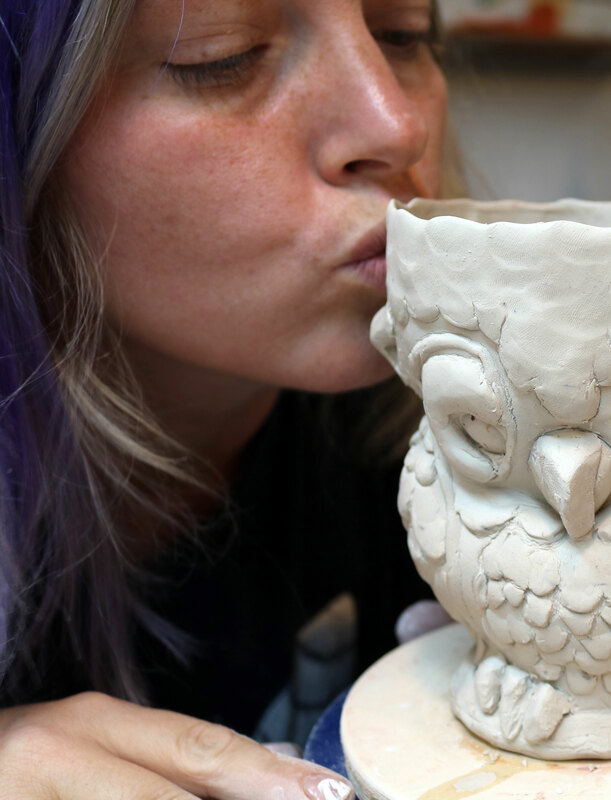 As a young potter coming out of graduate school, I took a lot of pride in being an independent woman, at making a name for myself, and at being an entrepreneur. This was a big part of my value set, and my identity as an artist and as a woman. But as I got older, I wanted a family, and I wanted to experience my children growing up. At times, there is an overwhelming sense of impossibility to both the job of being a full-time parent and the job of being an artist. They are irreconcilable on some level, but I will probably be able to make work until I’m seventy—long after raising kids. I’ve always been a planner, the kind of person that thinks about the future and what I want in it. 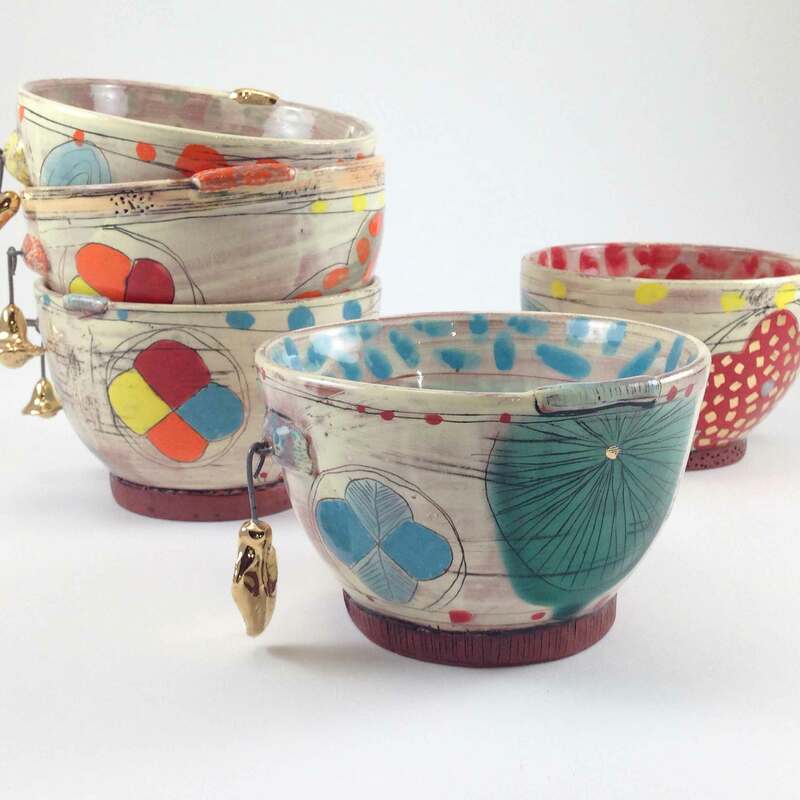 I know that twenty years from now I won’t regret not having made a thousand more pots. Choices may be clear to me, but often they are not painless. I am fundamentally wired as a maker, so though it is not easy for me, I look at things in the context of the overall arc of my life, and have realistic expectations for myself and my studio practice. Beth: Thanks for your insights on that, ladies. It’s encouraging to realize I’m not alone in struggling—and sometimes failing—to find that elusive balance between different types of work which are also hard-wired into my identity: artist, wife, mother. Like you, Kari, I tend to take a broader view these days, trusting that making art will always be part of my life. So making less pots for a period of time does not define or sacrifice my long-term success. I want to acknowledge Leanne’s point that male artists seem to be able to navigate these challenges with a little more ease, perhaps because the ones I know often have the support of their wives in managing the nitty-gritty of their businesses. I’m guessing the differences in our three family scenarios play into this. [Leanne is the primary wage-earner with an artist spouse who works full-time, Kari’s husband is the steady employed one but is also a ceramic artist, and Beth’s husband is steadily employed, but is not an artist.] My husband and I depend on some income from me. I think relationship dynamics probably have a lot to do with how we navigate our artistic careers. That is fuel for another discussion, but one I’d be curious to have with fathers as well. I moved at least every three years of my life until I somehow found myself planted in a tiny, remote town in Colorado twelve years ago. As I’ve put down roots and begun to engage more in civic life, I think of myself almost as much a “community artist” as a potter. 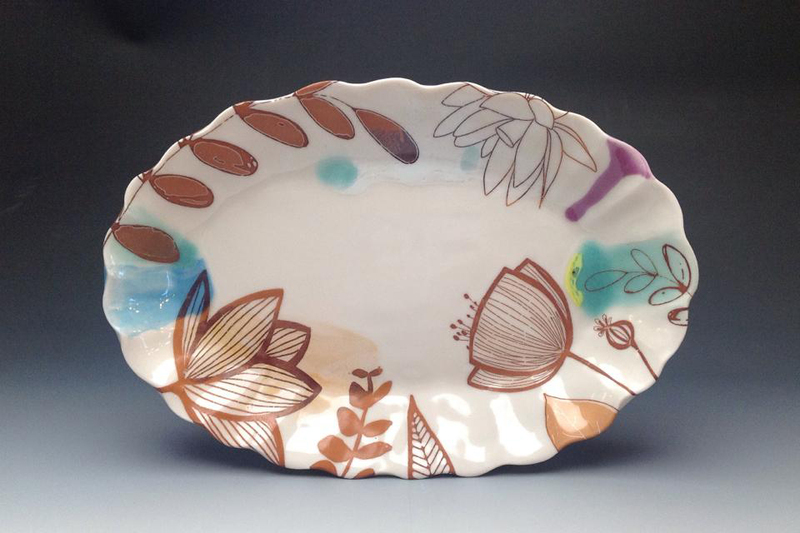 I recognize that impulses that have always informed my pottery, such as a connection to history and a nostalgic yearning for place-based identity, are at work in new ways. As you both have settled in one place and are raising a family, what role, if any, has local community played in the support, challenges, or development of your work? 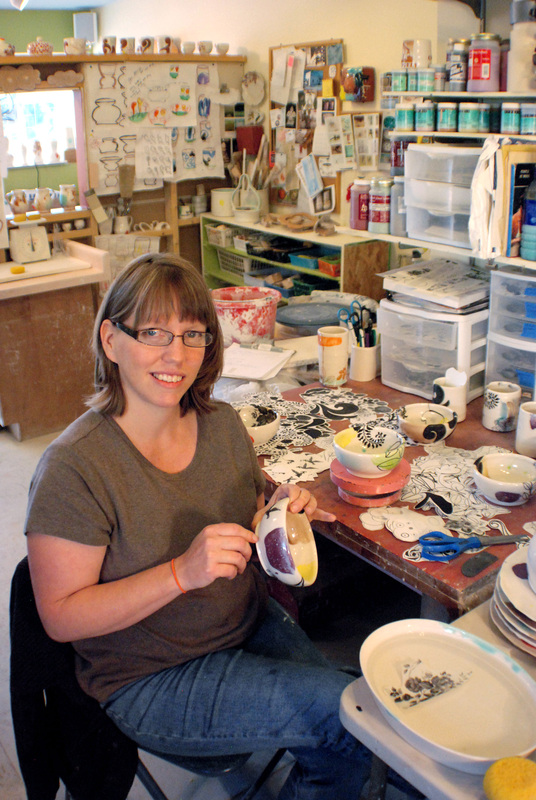 Leanne: The nomadic part of getting an academic education in ceramics has not allowed me to be close to my [extended] family or to have a strong local community network for either raising kids or getting work out there. I can see how being a mom, an artist, and an academic would be totally different if I could just drop the kids off at Grandma's house. My husband and I have been operating mostly on full-time swing shifts with the boys. I generally teach two long days a week, and his work is flexible, so those are his two days off. When the boys were babies, they were home with one or the other of us. 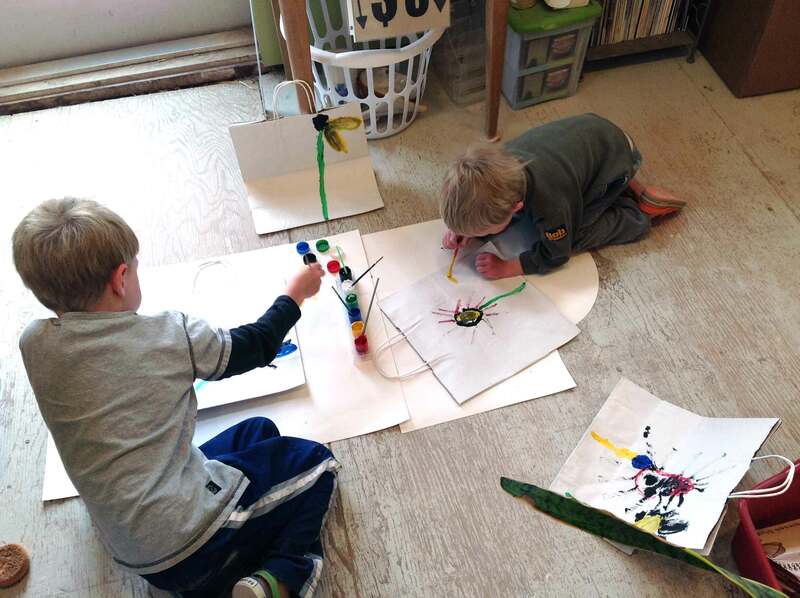 There is some part-time preschool until they are four years old, but that means about eight years of serious boy-wrangling at home until full school days kick in. We have a sitter that helps out occasionally when I have show deadlines or meetings, but it is irregular. My current lack of the "village" it takes to raise kids has certainly had an effect on the amount of studio time I have. And my life now is very different from the thirteen years when we lived in Baton Rouge, where I enjoyed an abundance of local sales. Living in the Chicago area, where I moved five years ago for my career, has been a fairly isolating experience. What that means is that I need to push harder to get out and show nationally, and to be more vulnerable and extend myself into new situations but also to build awareness of my work locally. I’ve expanded my ideas of what friendship and community mean to me since moving here. I feel very fortunate to have had deep, ongoing, and long-distance conversations with people I’ve known for fifteen or twenty years, such as this one. Kari: We moved from Philadelphia to Maine because of a teaching job that my husband, Ian, landed eleven years ago. A strong community has always been important to us, so it was hard to leave Philly, where we’d had one instantly upon arrival, similar to my experience of entering graduate school. In Maine, we bought a house seven miles west of Portland in an area that was touted as the “Brooklyn” of Portland. It’s the home to which we brought both of our children after they were born, and over the ten years we lived in it, we renovated all 950 square feet, from top to bottom. I spent the first half of our time there with a big eye on community, teaching adult education classes in the teachers’ lounge at the vocational center, sitting on the arts and culture committee, organizing our town art festival, doing local craft shows, and hosting home sales. The economic collapse of 2008 was a major buzzkill and setback for our working-class mill town. Art was the last thing anyone was thinking about. Before having children, I found myself very lonely while working those big twelve-hour days. I longed for my previous days of working in a dynamic shared studio—the conversations, energy, and camaraderie that came with a communal space. When the kids showed up, I was very grateful to have kept my home studio. I worked with supreme efficiency during their nap times and felt very fortunate that I did not have to commute with my kids to watch cones fall at all hours of the night. The good fortune of having family, babysitters, and one to two days of daycare each week, made my studio practice possible. Approximately a year and a half ago, we bought a house in Portland that had more space, which we desperately needed. It is across the street from our dearest friends, who have children the same ages as our kids. 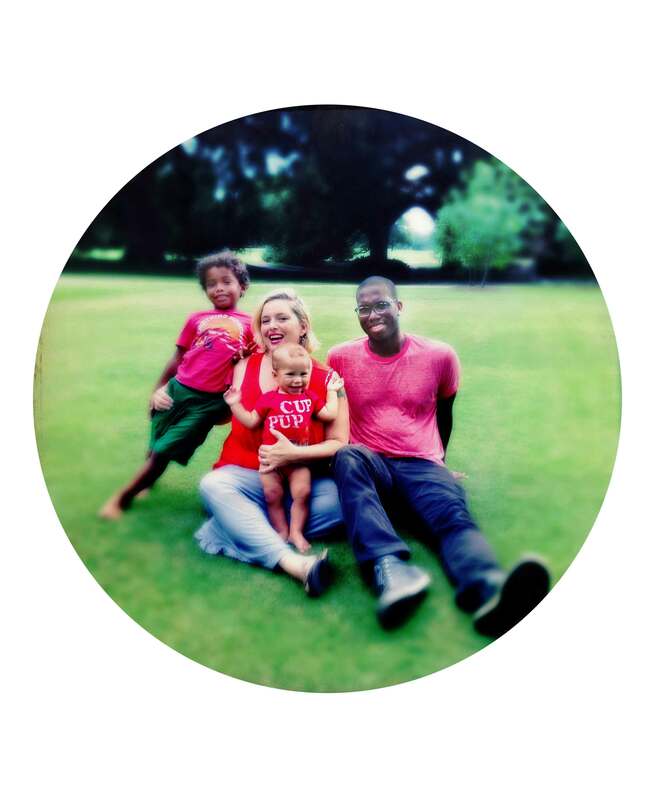 This proximity has changed our lives—we share in childcare, meals, and many other domestic chores. The extra support has allowed my studio practice and teaching schedule to grow. I think that my family is at its most communal yet. It has all the benefits of “the village” but none of the fights over dirty dishes. Beth: How do you feel about having “made the choice” to wait until later to have kids? Leanne: I know I wasn't "ready" to have a career and kids earlier in my life, but if both were to have happened then, I'm confident in my dedication to the field and that I could have made it work. The choice to have children after grad school, after years of teaching, was really more happenstance than calculated. The advantage for me as an older mom and working artist is that I am less anxious about where my career needs to be. I’m not an “emerging” artist anymore. I keep a regular studio practice and fold motherhood into that practice. When each of my children was a baby, I wore them wrapped in a sling, snuggled to the front of my body while I was in the studio. Now that they are older, they have their own table in my studio and they draw, or paint, or play in the basement. Where age has been a real kicker was in my physical ability to have kids. That was no easy path. It took an emotional toll, but it has also given me an ocean of content for my work, which is autobiographical. I spent many years in a state of grief, mourning a future that [I thought] would never be and learning to accept what is. I am fortunate to be an artist, to have an outlet for understanding my experiences as human. Kari: How has the juggling act of being a mom, partner, teacher, and studio artist affected or changed your work or practice? Has it provided new material? Are there any clear lines you draw to protect these opposing forces? Leanne: One of the most powerful lessons graduate school taught me was how to deal with intense pressure, deadlines, and multitasking. Those adaptability skills have allowed me to work heroic hours and still take the boys to soccer. Where I gloss over is housekeeping. I would rather make the dishes than do the dishes, and I am totally OK with not being perfect. I do the best I can with my strengths and learn to accept my flaws. On the other hand, not being able to dive as deeply into my work and stay extra-long hours in the studio has necessitated new techniques and ideas. For instance, I used to spend hours creating one-of-a-kind drawings on the surfaces of each piece. I started playing around with relief printing onto the clay about six years ago. I now make editions or series of similar pieces rather than making unique pieces. I spend more time designing, and creating more efficient work-flow systems, and have learned how to make more effective choices. My studio is in the basement, which means I can work in short bursts while the boys are sleeping or at school. I think the computer-fired electric kiln is a mom’s best friend. Pushing a couple buttons and walking away so that I can focus on other aspects of my life is fantastic. I also spend more time reading, writing, and drawing, working different angles of my creative brain. Beth: My studio is a mile from my home, and its separate location has always drawn a clear line between studio work and home life, albeit one that does manage to get crossed. As a functional potter, I intuitively see limitations as opportunities for creative problem solving. When my first son was born, I had to learn how to work in a completely different way than I ever had before. I was used to long hours in the studio, especially close to deadlines, with an artistic process that cycled through phases of idea development, intensive making, rest, and recovery. There is no room for that type of cycle—in the manner I was used to—in family life. I have had to adjust my studio practice continuously over the years as the kids have grown, and I still struggle with it. Life with a new baby only allowed for an hour, or few, at a time to try to refocus on other tasks, and that was with sleep deprivation to contend with; whereas now that my kids are six and nine, and in school all day, four days a week, I have longer stretches of work time. Like Leanne, I have found ways to focus on efficiency in the making process as a solution to not being able to tend to pots daily. In general, I find my brain still cycles through the same phases—develop, make, rest—but over much longer stretches of time. Since sales have been an important component of being an active maker for me, I have had to make work that I can finish in an hour or two and leave to dry, and then plan ahead for times when I need to monitor the drying carefully (very important when living in the desert) in order to trim or add handles later. This way of working frees me up to spend more time on surface decoration, which I can do despite endless interruptions. Streamlining and efficiency are good teachers and were novel challenges for me ten years ago when I was first married. At this point any novelty has worn thin, but I look forward to seeing what happens in the studio this first year when both boys are in school all day. They’ll probably walk into the shop from the bus stop when my arms are elbow-deep in my throwing bucket, and the shop will be open for two more hours . . . it’s exciting to think of this time as “our” creative time, and not just mine. Leanne: Did you two have a female mentor in the field? I had almost exclusively male mentors. Kari: I have been extremely fortunate to have had predominantly female mentorship in my career. Early on, I hit the jackpot. After undergrad, I moved to the Bay Area, and my jobs were working for Catherine Hiersoux, Coille Hooven, Nancy Selvin, and Sandy Simon—all women and all mothers. These were the first “professional artists” I had met in my early career. They made their careers in the studio and outside the walls of academia. They began their careers during a time when most “real” work was big, bold, physical, and hyper-masculine. I’m guessing, their incredible talent was surpassed only by their intense drive to be taken seriously in an environment which was probably not that welcoming of their perspective. Another mentor I have is Silvie Granatelli. I was not officially an apprentice of hers but was fortunate enough to spend two consecutive summers after graduate school working alongside her, Ian Anderson (now my husband), and Brian Jones, who was her apprentice at the time. This was the time in my life I was most unsure about what I was doing, and unclear about how I was going to move from the institution to the street, from the critique to the craft fair. At that time Silvie had been a self-employed potter for thirty years, and her commitment to everyday work, economic pragmatism, and unflinching idealism showed me how to live this life. Beth: I’m in between you and Kari in terms of experiences with women mentors. I primarily had very strong, very traditionally masculine teachers, who were respectful, motivating, energizing, and inspirational. But ultimately, our relationships were conditional on my participation as “one of the guys.” This was the dynamic in every program I participated in, academic or otherwise, through graduate school. I think the reason for this is partly generational, as early feminists initially gained opportunities and “proved their worth” by competing on the same playing field as men, with the same rules. As a female child of the seventies, I was programmed to approach work in this way. I worked hard to wield a chainsaw and sling fifty-pound bags with the rest of them and enjoyed every minute. With the privileges of youth, good health, and singleness, it worked for me during that time of my life. I would think and hope that these dynamics have evolved some, but I’ve been isolated from those kinds of environments for the last ten years, so I couldn’t say that that is true. A couple of years into what I call my “nomadic young potter” period, between undergrad and graduate schools, I had a strong desire to study with a female teacher. I enrolled as a Special Student at Colorado University at Boulder to study with Linda Sikora, who had just accepted a teaching position there. 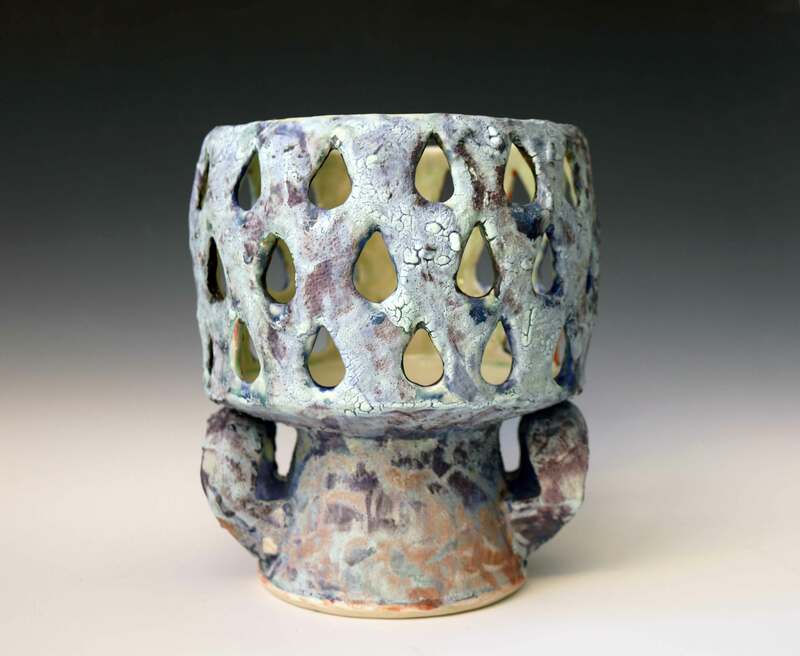 A year or so later, I began to work with Diane Kenney at the Carbondale Clay Center (CCC), which she had recently founded in Carbondale, Colorado. While there, I became close to both Diane and her longtime friend, wood kiln partner, and CCC teacher, Peg Malloy. By the time I left for graduate school a year and a half later, all three of us referred to Diane and Peg as our “clay mothers.” They were, and are, influential and important to me on so many levels; but to put it succinctly, they modeled the grown woman I wanted to become but hadn’t yet had a role model for: Someone who is strong and nurturing, independent, while also community- and family- oriented, balanced, and ambitious. Up to that point I had been a student most of my life. They gave me the glimpse that I hungered for of myself growing older in real, day-to-day life as a passionate artist and human being. Our relationships no longer center around clay, but they remain my mentors and role models more than fifteen years later. Since graduate school, as life has become increasingly more complex and nuanced, I have intentionally maintained a circle of women—some very close friends, some not—whose knowledge, experience, and resources I depend on as I navigate the layered and often conflicting roles of wife, mother, daughter, sister, businessperson, community advocate and volunteer, mentor, and artist. I occasionally work with young women, and I am conscious of the role I play in their lives and grateful for opportunities to give back and to continue to learn, as I engage the mentorship dynamic from the other side. Kari: We are all over forty, and have been out of graduate school for approximately fifteen years. What wisdom would you share with young women in the early stages of their careers? Leanne: When you’re looking into what your future could hold, define professional success with an open understanding of your personal needs. A tenured position at a Research I university is not the only definition of success, and it may not be the best fit for you. I have defined success as the ability to prioritize a regular studio practice, have some financial stability, and maintain a connection with community and loved ones. Beth: Leanne, I couldn’t have said it better. I think at one point we all talked about how over the years our priorities have shifted away from career-building activities, such as showing in the “important" clay galleries or teaching workshops, and that this is the result of pragmatic and financial decisions, as well as personal ones. As our perspectives have shifted, and as we’ve settled into the non-self-oriented roles of wife and mother and maneuvered around those roles, we’ve integrated and redefined our roles as artists. The “wisdom” I would share is this: Cultivate your relationships with women, on any level, so you have resources to lean on and learn from as complex life issues arise. Also, be patient; don’t be afraid to take time off. As an artist, focus on your creative growth and maturity, which may take many forms, rather than career milestones. This is what will ultimately feed you over a lifetime of making work. Trust your processes and don’t be afraid to let life and art unroll before you in unexpected ways. If you understand that the hours you spend pacing the floor bouncing a colicky baby is the same type of meditative and visceral experience as wedging those eight-pound balls of clay over and over each day, you will understand that both activities feed your creative brain. Art and daily life will seem to be less in conflict with each other. Kari: I agree with both of you. Basically we are talking about having the maturity, wherewithal, and strength to define one’s life goals for ourselves, not according to some stereotype of being an “art star,” and to be able to sift through the noise of other’s expectations and to define success in our own terms. I've observed that in each of our cases, success still involves a studio practice. I don’t hear that any one of us is willing or able to give that up. I think that says something fundamental about how our identities, in fact, probably our whole being, is fundamentally tied to making and committing ourselves to a creative practice for life. Leanne: I would add that even though the ceramics field has strong female leadership and representation, there is still a tremendous amount of work to do toward bringing about equality in regard to gender and minority representation. 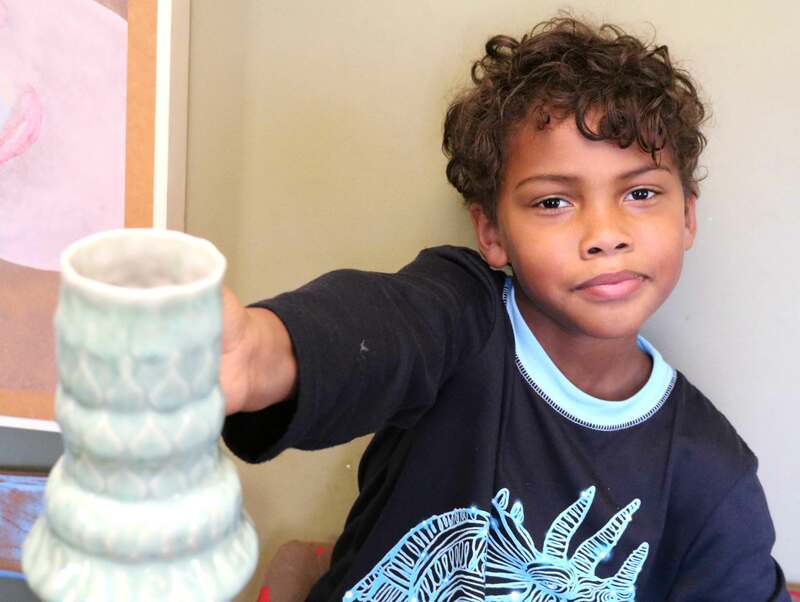 I have seen, heard, and experienced some terrible acts of discrimination and bias, which can get muddled with our understanding of a ceramics community. Vigilance in promoting inclusion and representation is necessary. The conversation must be as recurrent and as thoughtful as conversations about firing practices, geeky shino love, or craft in contemporary society. It may be uncomfortable to look at the attrition rate of women, or the socioeconomic and racial make-ups of our field, but we have to “check in” to these conversations to ensure that our community is healthy. We can make room. Leanne Cambric is an assistant professor at Governors State University located in south Chicagoland, where she lives with her husband and two boys, ages 3 and 7. She grew up in Alaska, received her BFA from the University of Minnesota, and her MFA from Louisiana State University. She handbuilds in porcelain with a strong sense of allegorical autobiography.